Exactly twenty years ago, in 1997, the legendary comet C/1995 O1 Hale-Bopp was putting its incredible show in the sky. A countless number of people started looking at the sky thanks to this comet. For me it was like a Big Bang in my observing activities. If I can trace back the seeds of the Virtual Telescope, 1997 was when everything really started. To share my images of this comet, I created my first website, one of the first ever in Italy about astronomy, still available (though no longer updates, see here). Above is one image I captured on 31 Mar. 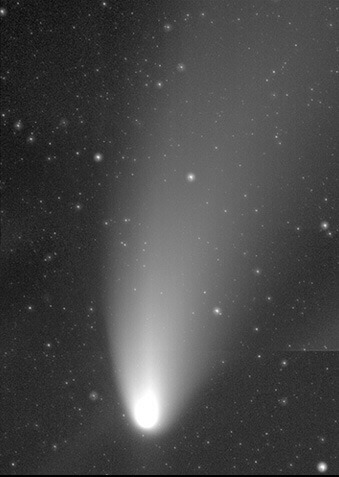 1997 with a 180-f/2.8 Zeiss lens, showing the typical shape of comet Hale-Bopp. It reached the perihelion exactly 20 years ago, on 1 April 1997. 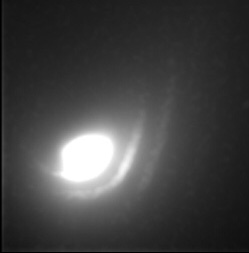 I also documented very well the dust shells visible close the nucleus, from where I inferred its rotational period, in excellent agreement with the one found with large, professional scopes. I used all my observations of comet Hale-Bopp for a work I presented at the University of Rome “La Sapienza”, where I was a student in astrophysics at that time. I will write extensively about that passage in the next days, but I wanted to share these thoughts on the 20 birthday of Hale-Bopp perihelion. Looking forward to another epic comet like that!